I worked in the Fire Dept of Hawker Siddlely [Hawker Siddley. Ed.] Dynamics late 60s early 70s.I was sub Officer to Station Officer Albert Horne at the time, we used to have yearly Fire competitions every year against mainly Aircraft factories around Hertfordshire our main opponents were allways BAC, the last year i was there we won every cup and can remember the Chairman of the Company being over the moon and had all the cups displayed in a specially built cabinet in his office, he invited me up to get approval along with Albert of course, He was very proud of our Internal Fire Brigade and of course would not have won if not for our team who worked so hard to win. I can remember the Fire Station quite small but had two fire appliances that were always at the ready.The Fire team were always on standby by way of company alarms and would assemble at the Station in the event of an fire of which i can recall hardly ever happened as we were always on patrol and giving advice and keeping fire regs up to date, everyone as didcated to safety, had to be building the Blue Steak Rocket was no mean feat. Like many of the people on this comment page I too served an apprenticeship at B.A.C. and I very much doubt there are initiatives offered to young people today which are of the same high quality. We were very lucky. Following my apprenticeship I continued to work there for four and a half years before leaving at the end of 1969. Yes I remember the canteen where the Premier Inn is now, there used to be different serving rooms according to your level in the company. The food was good and as an apprentice you got subsidised meals up to the age of 18 – still got my meal pass!! Worked in many different departments as an apprentice and afterwards worked in N & P buildings until I left. It focuses the mind when you look at the industry that existed in Stevenage during the 60’s/70’s and which has since vanished. In its prime B.A.C. employed 7000 people. I’m having trouble identifying the aerial shot of the factory above!! I was an apprentice at the Hawker Siddely Dynamics site in Hatfield starting in September 1969. Following my apprenticeship I was employed as a design draftsmanship in the guided weapons design offices and was then seconded to Stevenage working on the USGW (under surface guided weapon) project in 1975, which was a submarine launched sea skimming anti ship missile. got cancelled and was to be replaced by an American missile instead, but this nether happened either. From the ashes of USGW grew another missile study which did become a success and went into service some years later as Sea Eagle. Although by this time I had left the company to work for Marconi Elliott Bros, my father Anthony Caesari (aka Chez) who I can thank for coaxing me into the industry was the Chief Designer of Sea Eagle. Prior to his time working on missiles, in the early 60s he played a significant part in the Blue Streak space programme also based at Stevenage working alongside some of the inspirational leaders of the day…Charlie Martin worthy of mention here. For all of us that can remember these times, I am sure we can all agree the Industry provided us with a firm grounding for shaping our careers. I am happy to say I still enjoy the challenge of the workplace and the learning it offers after nearly 50 years in the Industry. I served a 5 year apprenticeship there mostly in the Instrument Wing toolroom until I left in 1965 and emigrated to the USA. I have many memories including my pre apprenticeship working in different departments including the Pilot Factory and the Library in O building. I also worked in the Lapping Dept, Grinding Room, Cutter grinding and learned a lot of very high level precision skills that served me well until I retired. The RoundAbouts near the factory were part of my personal race track on the way to and from work on my motorcycle…good times that I look back on with fondness…at least until I got my first speeding ticket. I began my working life as a pre-apprentice at English Electric in April 1955. I was located in the ‘Pilot Factory’, which still exists, moving across the road to A-B building when the builders finished it. The canteen was located where the Premier Inn now stands. In September 1955 when I became 15 my apprenticeship began in the training school on Wilbury Way in Hitchin. I left English Electric in 1964. It was a good start to a life in engineering and now good to look back on. 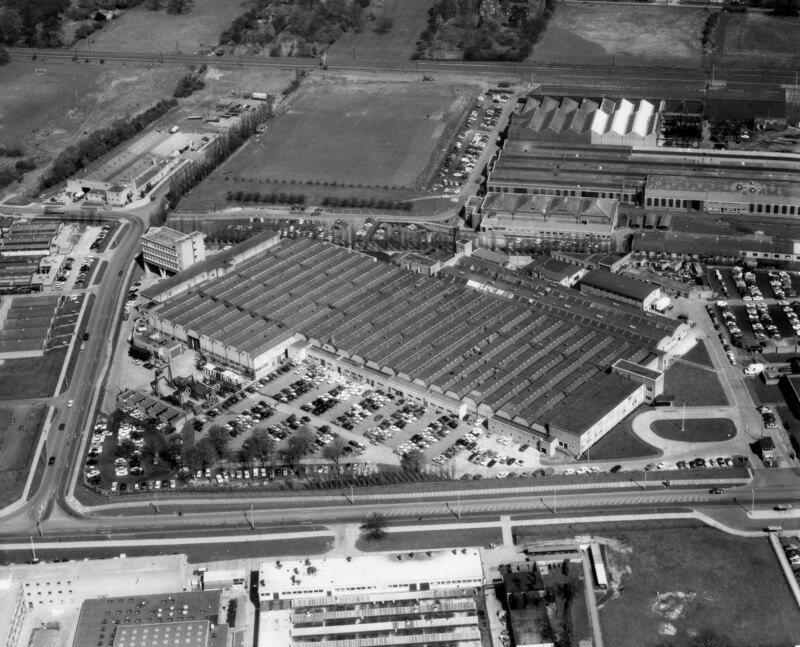 Just to go back even further … I started my Apprenticeship at English Electric Ltd in 1957 well before it was even renamed English Electric Aviation or any of the ongoing name changes. One memory I have of those early days was that if you wanted a cup of tea at teabreak on the shopfloor, you had to buy a Two Shilling card of Penny and Halfpenny Tea tickets to make your purchase as the Tealady didn’t carry cash on her trolley. If you also invested in a bread roll and butter, the butter came in little round pats with the English Electric logo impressed in it ….. just so you didn’t forget who was in charge!